A piece which is balanced between elegance, rigour and functionality: a creation of the Architect Giuseppe Carpanelli. The desk is sculpted through calibrated curves and, from being a static object, thanks to its shelves and form, it becomes a table for a dynamic office. 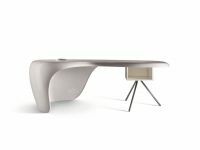 The desk with crystal top (SC 15) makes it possible to admire the base with a curved parabola. The all wood version (SC 16) has a cherry-wood top with a band of briar-wood and rosewood with stars and inlaid filleting. In the cylindrical body there are 4 wide drawers with mother-of-pearl knobs and 2 extractable, invisible shelves (they are enclosed in the borders). 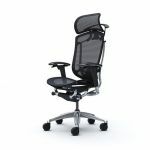 The structure is solid wood plated with cherry-wood, zebrano, briar-wood, rosewood and palisander. The skirting board is palisander, the parabola is cherry-wood and walnut with inlay filleting. There is a secret compartment. ZEBRANO Glass Cabinet Bookcase with transparent crystal central sliding panel.